What was Nordic Tugs up to, I wondered, when it plunked a flybridge atop its venerable 42-foot trawler? Trying to make a vintage sea queen look like a princess? Adding some pizzazz to its much-loved but quarter-century-old styling? It didn&apos;t take long to discover that the Burlington, Washington, builder of raised pilothouse/style tug yachts created a flybridge option because its customers asked for it, and that means it may sell more boats. It took even less time to realize that the 42 is no dowdy dowager counting on a "new do" to find romance. My first ride on a Nordic 42 was in 1995, aboard hull no. 1. She was named Eight Stars and had been pressed into charter service in Alaska, where she still thrives. I have not been aboard a 42 since, and my error was in assuming the model had not changed over the years. Recently, I boarded a flybridge 42 being prepared for new owners. There was a jumble of equipment, boxes and crates full of stuff, and other gear in the cockpit and saloon. Adding to the confusion was a team working to clean the boat and stow everything neatly. A quick look, however, revealed that the 2005 Nordic Tugs 42 is not the boat that launched the line a decade ago. There have been many changes in the yacht since then, in styling and construction techniques and in quality of finish. The Lynn Senour/designed hull and deckhouse have not changed. His genius persists and is respected by Nordic Tugs. Nordic Tugs began in 1980 with a 26-footer powered by low-horsepower diesel engines. A 32 followed, then the 42, with larger engines and more speed. The builder since has launched a 37 and a 52. Since its first boat was unveiled, the company has sold more than 600 boats. More than 70 are 42s. Gather boaters around a coffeepot and talk flybridges, and you&apos;ll find they are either loved or barely tolerated. Some have them and never use them. Others are so smitten that they make the bridge the boat&apos;s command center and remain aloft until ugly weather finally forces them to find shelter. Barbecues, ice makers, sinks, and bimini tops turn flybridges into party places, too. Some love flybridges so much that they erect a vinyl penthouse and install heat to make the space usable in all weather. They never need to go below. That vinyl enclosure is a good place to store fishing poles, fenders, cushions, and other gear when the boat is out of service. There are boaters-all traditionalists, likely-who look at a flybridge atop a raised pilothouse and wonder why such redundancy is necessary. But others, including me, think there can be no better place from which to plot a course through an ice field or along a narrow channel, to watch whales and porpoises frolic, or to relax at sunset. In my view, raised-pilothouse boats are the best. Putting a bridge on top is a bonus. On the Nordic 42, the new flybridge rests lightly atop the pilothouse, as far forward as possible. It obviously is designed for fair-weather cruising and- owing to its superb, unlimited, 360-degree visibility- for maneuvering in marinas and anchorages. The helm is off-center to port, and the demo boat had a single helm chair. There is space for a second, however. Aft, against the railing, is an L-shaped settee for three or four visitors. Instruments are enclosed in pods that, when not in use, fold into flat decks on each side of the helm. Under way, the pods open to make engine controls, gauges, and basic navigation systems easily available. An innovative feature, I thought, one that should protect equipment in wet weather. The demo boat was equipped with a Raymarine package of electronic equipment. A small monitor on the left pod displays basic info-depth, speed, and course-and allows control of the autopilot. It might be possible to squeeze a small monitor for a chart plotter or radar into the right-side pod, but why? If cruising conditions became so difficult that radar were needed, I&apos;d go below to a warm boat with good nav displays. There&apos;s a bow-thruster control, too. I would ask for a rudder-angle indicator, as well. A bonus feature: The bridge is designed for easy removal to simplify shipping. Many Nordic Tugs are delivered cross-country by tractor trailer, and this feature is helpful to the company as well as to owners needing to move the yacht over land. "This is not just a piece stuck on top of the boat," explains Bob Shamek, marketing sales manager for Nordic Tugs. 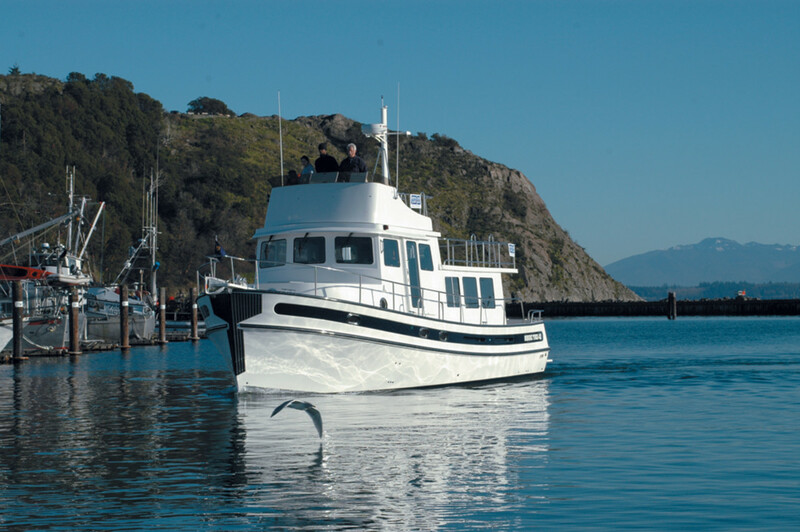 "We retooled the pilothouse roof to accommodate the extra load of the pilothouse and settee." Nordic Tugs&apos; hallmark faux smokestack has all but disappeared with the development of the flybridge. A bit remains, nearly invisible, on the boat deck aft of the bridge. Now that the stack is an insignificant design element, some boaters may need to look twice to identify the boat as a Nordic Tugs. On this boat, the builder installed electric steering on the flybridge helm instead of extending the main helm&apos;s hydraulic system. Electric steering is disappointing. There is no resistance built in, and the wheel spins smoothly without any feeling that something might be happening down in the steering gear. Also troubling was a slight delay in response to a turning command. While on a demo cruise, the delay made me believe I had not turned the wheel far enough, so I spun it some more with pressure from only one finger. Suddenly, I had dialed in a 45-degree course change, and the boat was turning across the path of an oncoming yacht. Fortunately, electric steering is history. 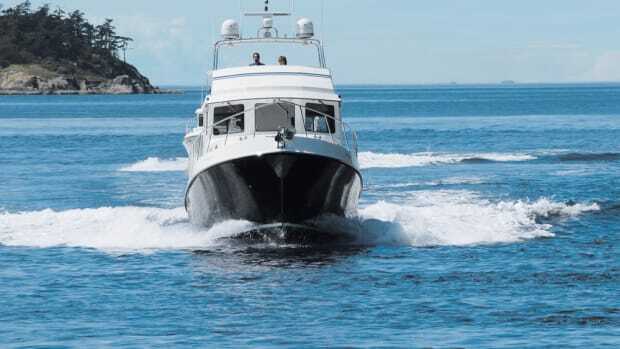 Nordic Tugs has returned to the use of hydraulic steering at the flybridge helm. Until 2003, the 42 Nordic had two stairways leading to separate staterooms. One led down from the saloon to a sleeping area and head for guests beneath the pilothouse. The second wound down from the pilothouse to owners&apos; quarters in the bow. Over time, the company had learned that many buyers of 42-foot boats are over 55 years in age. With advancing years come worries about navigating a curving stairway with narrow and steep steps while a boat slogs through messy seas. Recognizing that concern, NT eliminated the pilothouse stairway. Now, the guest stateroom is to port at the foot of five home-style steps from the saloon. It has a nonvented washer-dryer combo as well as a hanging locker and other storage. A head with separate shower is on the opposite side of the landing, along with a small office, complete with a desk and seat and the main electrical panel. The master stateroom is in the bow, with a queen-size island berth and a full head. Throwing out the pilothouse steps created a place for the separate shower that&apos;s now in the guest head and also allowed designers to go wild in redesigning the pilothouse. They put a comfortable seat in the stairway space and then did something unusual-they made the seat face aft. It&apos;s a nice place to curl up and read or to chat with the skipper and guests on the pilothouse settee. But its orientation also means that someone resting there would be no help in watching for other craft, debris, or navigational waypoints. I&apos;ve talked with owners of Nordic Tugs who like the 42 flybridge. Some proposed converting the former stairway space to bookshelves and chart storage. I imagine the company gladly will build it that way, too. Other changes introduced over the years include adding a saloon entertainment center, with a television and a Bose sound system installed. Corian counters replaced plastic laminate. An ice maker has been added, and the builder now uses Ultrasuede, rather than cloth fabrics, for upholstery. Woodworking has become more sophisticated with the addition of teak window valances and an artful, curving, teak handrail on the steps to the pilothouse. NT employees manufacture all the wood parts, except for teak handholds, the saloon table, and the steering wheel. My memory tells me the first 42s had well-fitted teak paneling and woods. But the newer models seem better. Improved craftsmanship makes this so. But Nordic Tugs&apos; increasing emphasis on modular construction- in which cabinets are built with precision in a wood shop and then dropped into place in the boat-also contributes to perfect fit and finish. The galley has been redesigned, with the sink moved from an outside wall to an athwartship counter. On the exterior, Nordics have been given a harder rubrail with a stainless-steel insert. "White" hulls are oyster colored, a change from a colonial-ivory tint. Many buyers, however, choose from a list of vibrant hull colors, including Nordic blue, flag blue, storm gray, red, brick red, and green. In construction, Nordic Tugs has applied new techniques to old designs. The 42, like its sisterships, emphasizes the use of stitch-mat fiberglass fabric, a change from roving fiberglass material. Vinylester resins are used in the skin coat-the first beneath the gelcoat-for added protection against blistering. Many panels now are manufactured using vacuum-infusion techniques, which produce lighter and stronger fiberglass components. Hulls are handlaid, solid fiberglass. Balsa coring is used in deckhouse structures, including those that are vacuum infused. In the engine room, the 330hp Cummins engine of a decade ago has been replaced with a 450hp diesel by the same maker. "She is a dramatically different boat today, yet she offers the same great usability," Shamek says. We boarded the 42 through a transom gate. The full-width transom is nearly 7 feet deep and has a fiberglass storage cabinet on the starboard side of the saloon bulkhead. A box for storing propane tanks is under the ladder to the boat deck and the flybridge. The lazarette hatch rises easily on gas struts, and deep, wide gutters ensure that any surface water will be carried overboard and will not drain into the storage area. Below decks, there is space for a lot of stuff-as proven by the loading crew-as well as an Espar furnace and washdown pumps. The upper deck drains into the cockpit via stainless-steel tubes. Knowing the kind of crud that can settle on an exposed deck, I suggested that eventually the cockpit deck would be stained by drainage. Greg Mustari, a veteran NT sales representative for Skipper Cress Yacht Sales in Anacortes, Washington, says "Not so." Side decks are 14 inches wide at foot level. A stainless-steel railing runs the length of the boat, with gates at the pilothouse doors and openings for cockpit entry. Years ago, Nordic Tugs gave up the wood doors that often warped in extreme weather and always seemed to need refinishing. The saloon and pilothouse entry doors on the 42, as well as all windows, are white-painted, heavy, aluminum-andglass panels made by Diamond Sea-Glaze of Canada. Entering the saloon from the cockpit, you&apos;ll find to starboard a convertible settee with a table. To port are shelves in the outer wall, with space for a small chair. The galley is forward on the port side and includes a double sink, a propane stove, a refrigerator-freezer combo, a trash compactor, and an ice maker. Although the saloon is carpeted, the galley has a teak-and-holly surface. All living spaces offer at least 6 feet 6 inches of headroom, enough for just about anyone to cruise in comfort. Nordic Tugs built for northern climates are fitted with a furnace and a propane stove. 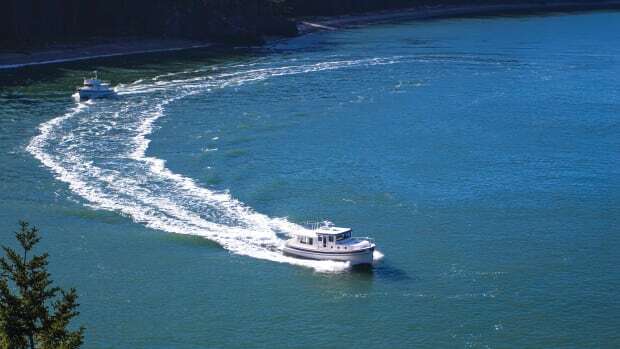 Yachts headed for warmer areas are equipped with air conditioning, an electric galley, and a larger generator to carry the heavy electrical load of air conditioning. The engine-room access hatch was moved slightly in this model to make entry easier. It&apos;s 46 inches from saloon sole to the bottom of the boat, but an engine-room step makes it manageable. It&apos;s a crowded space, with not much headroom. On the demo boat, the engine room was shared by the big Cummins, a 9kW Onan generator, two fuel tanks, a water heater, vacuum generators for two VacuFlush toilets, six 6-volt golf-cart batteries for house use, two 12-volt 4D batteries for starting, and an oilchange system. Fuel and water tanks are welded aluminum. After the sea trial, at the Nordic Tugs factory in Burlington, Washington, I asked why the tug yachts are built without drip pans beneath engines (except for the 52-footer, which has a deluxe stainless pan). The answer: Ribs molded into the bottom of the boat will contain engine fluids-including coolant and oil-should a failure occur. Nothing should reach a bilge pump or be pumped overboard. Nonetheless, one owner told me he had had "a heck of a time" cleaning up transmission fluid he had spilled while servicing his gearbox. A dedicated drip pan would contain leaking fluids in a more compact area, be easier to keep clean, and guarantee that no pollutants go overboard. It&apos;s something I would expect to find on all craft, but especially in a boat costing more than half a million dollars. Suddenly, moving in was complete. Everything had been stowed, and Mustari started the big Cummins engine and headed toward Fidalgo Bay. The standard bow thruster earned its keep, helping him make several sharp turns on the way out of the crowded Cap Sante Marina. Mustari has been driving Nordic Tugs so long that to him, the flybridge seems a foreign place. He says he is more comfortable piloting the yacht from the lower helm, particularly in a crowded harbor. Mustari says most owners run the boat at 10 to 12 knots. At 10, the Cummins is turning 1800 rpm and burning about 6gph; at 12 knots, engine speed rises to 2200 rpm and fuel consumption to about 9.5gph, according to information developed by Cummins Northwest, Inc., an engine distributor. The 42 will cruise faster, at a price. At 16 knots, with the engine turning 2500 rpm, the Cummins burns 1 gallon of fuel per mile traveled. The sea was placid and we buzzed along, easily dodging crab-pot buoys, tankers at the nearby refineries, and other boats out for the day. Thanks to Senour&apos;s hull design, the Nordic-in fact, all Nordics- handle well, whether moving slowly or at top rpm. Other than the eccentric electric steering, the new 42 performed well and responded quickly. With the new owner&apos;s gear aboard, all we needed to get out of town was fuel and a few bags of groceries. However, after an hour in the sun, we returned to the harbor, and Mustari descended from the flybridge to demonstrate his close-quarters skill at the lower helm by quickly making a right and two left turns-one of them almost a 180-with ease. There&apos;s one more new thing at Nordic Tugs today: The company now writes a 10-year warranty (up from 5 years) against structural hull failure. It also offers a 5-year warranty against osmotic blistering of the hull (from the keel to the waterline) and a 1-year stem-to-stern warranty against any failure of any component or piece of equipment. Nordic Tugs are seen everywhere almost, from Alaska to Mexico on the West Coast, in Florida, along the East Coast, and on the Great Lakes. 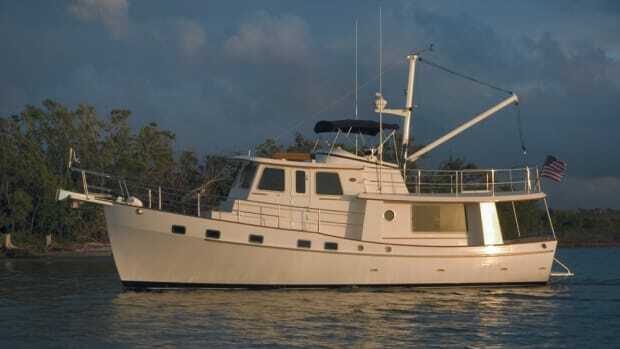 Stout and reliable, they make fine coastal cruisers, and skilled skippers guide them to all kinds of secluded places. Along the Inside Passage where we cruise, NTs seem to be omnipresent. Their owners explore remote nooks and make ocean crossings with ease, and we&apos;ve been passed by nearly all of them. Because of market competition, owner suggestions, and changes in technology, all Nordic Tugs built today are better than those of a decade ago. When the company decided to top the 42 with a flybridge, it was to offer a newer, better product-not to doll up a tired old sea queen. You say you don&apos;t want a flybridge on your new 42? That&apos;s OK. It&apos;s an option.